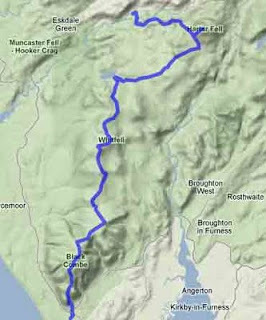 Well I'm nearly there, and thanks to my recent find (TrailZilla.com) I've managed to plan out the route for the 2 day walk + camp in the Lake District. I thought that, after seeing the route in Trail Magazine, I should give it a go and that the 1 night of Wild Camping would be great additional experience for my ML Qualification - what I failed to realise however was that there was no real route info and on reading the write up from Trail closely there was also no real path that they followed! Luckily TrailZilla has come to the rescue and has allowed me to plan the route (on OS 1:25k and 1:50k maps) in great detail and then download the .GPX route to my Garmin - happy days!